A view of Voulismeni lake, from the top of one ot the town’s many public staircases. With a lake and wonderful beaches right on its doorstep, the capital of the region of Lasithi has a special feel and an atmosphere all its own. The charming little town of Aghios Nikolaos, built on the site of the ancient city of Kamara, where Eileithyia – the goddess of childbirth and midwifery – was worshiped, overlooks Mirabello Bay on the northern coast of Lasithi. The present-day town was built in the 19th century and was originally known as Mantraki, but it later took the name of the delightful Byzantine chapel of Aghios Nikolaos, which is located 2.5km to the north. In 1904, the town replaced Neapoli as the capital of Lasithi. Above Voulismeni Lake, a cave entrance was given an ornate façade by the late film director Nikos Koundouros. Even though there’s no church inside, it’s a popular spot among locals and visitors alike. One of the main attractions of Aghios, as the locals affectionately call the town, is little Voulismeni Lake, which is connected to the sea by a narrow channel. Voulismeni is not just a wonderful natural attraction, it’s a place where you can feel the pulse of the town: quiet in winter, full of life in summer. Indeed, at the start of each summer for the past three years, the lake has been the venue for an international cliff-diving competition and show, where athletes from all over the world have the chance to demonstrate their skills leaping from a height of 20 meters. Four establishments offering wonderful views of Lake Voulismeni are: Migomis for coffee and ice cream (20 N. Plastira), Zygos Urban Garden for traditional skoufichta pasta made with carob flour (1 Ethnikis Antistaseos), Chez Georges for refreshing Negronis (2 Vitsentzou Kornarou) and Peripou which operates as a café-bar-library (No.25, 28 Oktovriou). It is also worth dropping in at Mesostrati (a grocery store specializing in traditional products) for cheese pies made with soft myzithra cheese, and fresh almond cookies (2 Roussou Koundourou). A modern sculpture, inspired by Amalthea’s Horn, on the town’s pier. 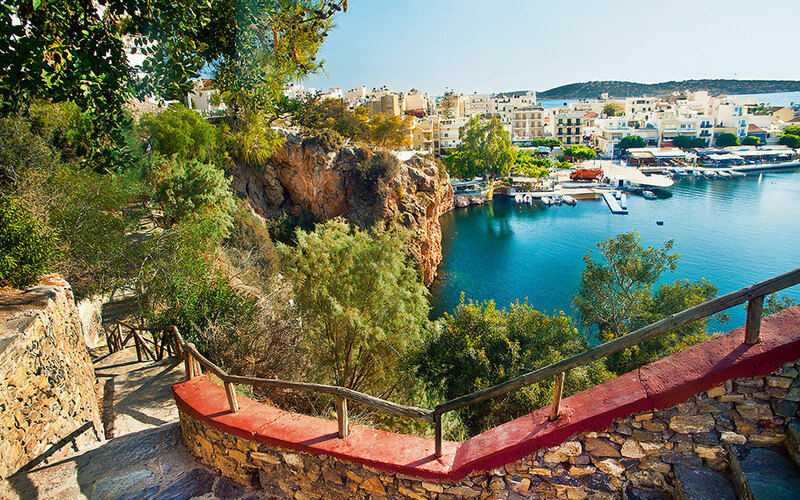 If you want to get another vantage point from which to examine the intriguingly amphitheatrical layout of Aghios Nikolaos, walk up its long series of public steps. Should you get tired, comfort yourself with the thought that you’re walking up a civic landmark, one of the unique architectural features of the town. In fact, the municipality, in collaboration with local art curators, is making plans to highlight the steps with a series of art events. Kitroplatia is the town’s most popular beach and has been awarded a Blue Flag. For shopping, head to 28 Oktovriou Street and its surrounding alleyways; there, you’ll find everything from herbs and extra virgin olive oil to souvenirs in the form of replicas of ancient Greek busts. 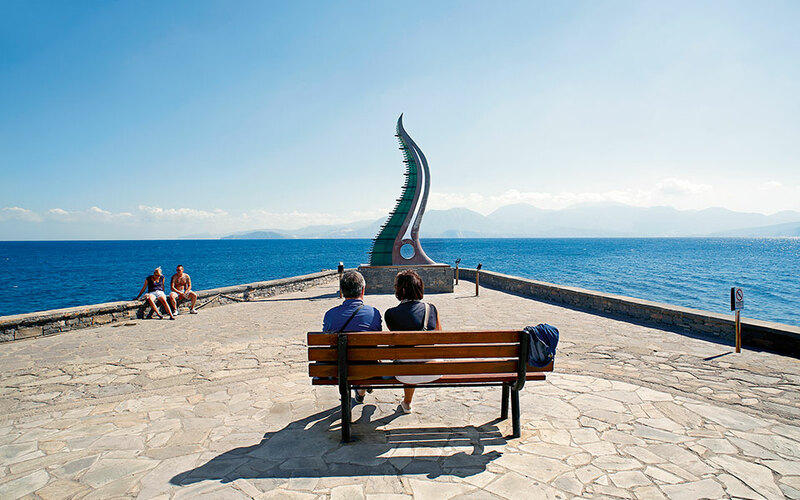 Stroll over to the Horn of Amalthea, a popular open-air meeting place dominated by an impressive modern sculpture of the same name depicting the horn from which the wet-nurse of the infant Zeus fed him with a self-replenishing abundance of milk and honey. Continue on to Kitroplatia (“Citrus Square,” named in honor of the town’s once flourishing fruit trade) with its lovely shops and pebble beach. Swim here or at sandy Ammos; both beaches were awarded Blue Flag status this year. In fact, the pristine town beaches of Aghios Nikolaos are one of its leading attractions.